Sarah Marks reflects on historians’ latest efforts to combine and compare East-West perspectives on Cold War science. A recent special issue in the journal History of the Human Sciences represents the sophistication and value of the new approaches, but it also shows that there is much more to be done to understand the ‘psy’ sciences in the Cold War. As the Cold War recedes into historical memory, scholars have begun to question their prior assumptions, such as the ‘bipolarity’ of the conflict, and the stark disjunction between East and West. 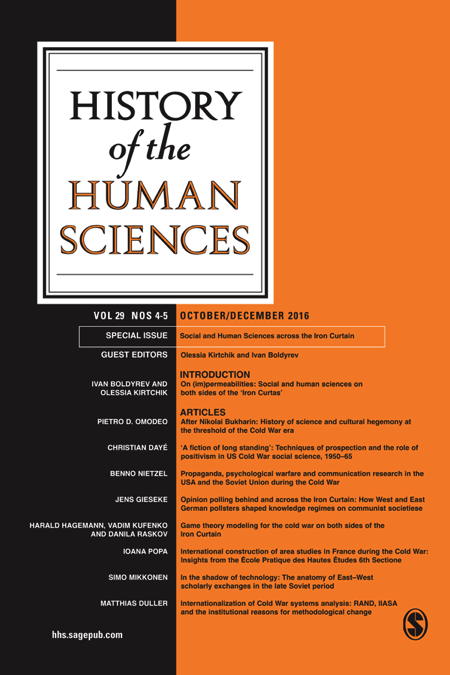 Historians of the human sciences, for their part, have sought new approaches to understanding how disciplines such as psychology, sociology, and medicine could not only exist on both sides of the Iron Curtain, but were sites of surprising intellectual creativity, sincere intercultural exchange, and sometimes nuanced applications of socialist philosophies of mind. However, these efforts have been hampered by lingering imbalances in the literature on Cold War science. As explained by the editors of a special issue in the journal History of Human Sciences, Ivan Boldvrev and Olessia Kirtchik, our historical literature has so far been more heavily weighted towards developments in the West. 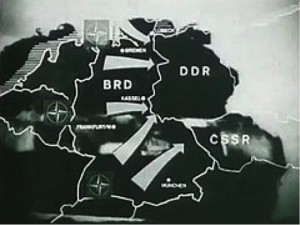 Moreover, historical narratives on both sides of the Iron Curtain tend to consider case studies in national isolation. This has effectively reified the ‘bipolarity’ of the Cold War in print, and continued its hold on our historical understanding. Boldyrev and Kirtchik’s collection is the first publication devoted to the entangled histories of the human sciences across both sides of the Cold War divide. Emerging from a conference held in 2013 at the Higher School of Economics in Moscow, it does important work to address the imbalance in the literature on Cold War Science. As the editors argue, the East has been ‘effectively written out of the standard accounts’, something which has strangely been reinforced by historical writing from within the region itself: ‘due to very different contexts and political histories the master narratives in the state socialist countries have presented the development of these disciplines as abnormal and isolated from what was going on in the rest of the world’. A quarter-century after the fall of the Berlin Wall, new shoots of research show that there were indeed vibrant communities of social and human scientists pursuing projects which did not fall under the standard Cold War stereotypes of Soviet research as ‘stagnated’, ‘pseudoscientific’, or ‘hindered’ by dogmatic ideological control. From within the former Communist region itself, the Institute of Contemporary History in Prague has become a key centre for research and debate, for instance on the technocratic sciences of governance, management and planning in the period of late socialism to ‘neoliberalism’. This has revealed unexpected continuities between the two apparently opposed forms of governance, suggesting that the conditions for the post-socialist transition were already present within Communist societies by the 1970s. But such projects are still a rarity. Boldyrev and Kirtchik’s special issue is thus an invaluable addition, not only for its effort to remedy this geopolitical asymmetry, but also for bringing transnational approaches to writing such histories to the fore. However, while these articles showcase cutting edge approaches —below I sketch three trends that are well represented in the issue—the collection’s silence in regard to the ‘psy’ sciences reminds us that there are many more questions to ask. Three of the authors’ articles take up the theme of ‘permeabilities’ across the two blocs. As has been shown for broader areas of cultural and intellectual endeavour, there was often much more by way of exchange of ideas, practices and personnel across the Iron Curtain than might be assumed, questioning the very notion of an ’Iron Curtain’ in the first place. Trading zones for knowledge in the human sciences sometimes emerged in particular West European locales, as illustrated by Ioana Popa’s article on ‘East/West interfaces’ at the 6th section of the École Pratiques des Hautes Études in Paris. Starting in the 1950s, this institute became a hub for the study of – and co-operation with – the socialist region. 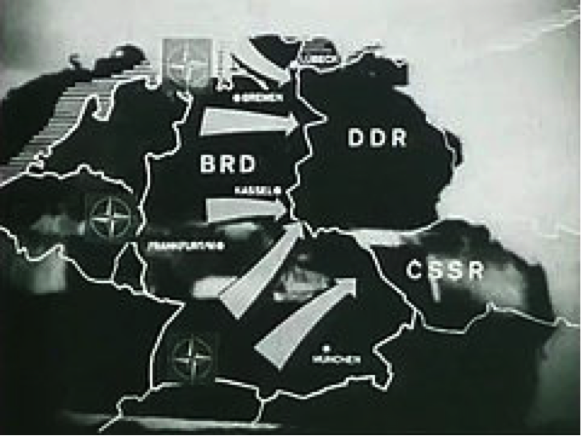 Bolstered by funding from the Rockefeller and Ford Foundations, Popa demonstrates that, at various points, it also became drawn into the web of American ‘Cold War intellectual warfare’.Matthias Duller foregrounds scientific transfers in his study of the ‘East-West bridge building efforts’ centred around the International Institute for Applied Systems Analysis. Launched in 1972 just outside of Vienna, the institute was charged with addressing social, environmental and technological issues at a global level, founded with co-operation from the RAND corporation, with a charter signed by American President Lyndon B. Johnson and the Soviet Union’s Alexei Kosygin. The role of Détente in opening up possibilities for collaboration is also explored at a much closer proximity in Simo Mikkonen’s work on Finland. He shows how one of the USSR’s closest democratic neighbours developed flourishing academic connections across their shared border during the 1970s. This special issue also adds to a small yet burgeoning literature on histories of Cold War science that hold the two sides up as a mirror to each other. Recent publications include Elena Aronova and Simone Turchetti’s volume on Science Studies, an academic field, intertwined with broader political concerns, which, they argue, both sustained and destabilized ideologies on both sides. 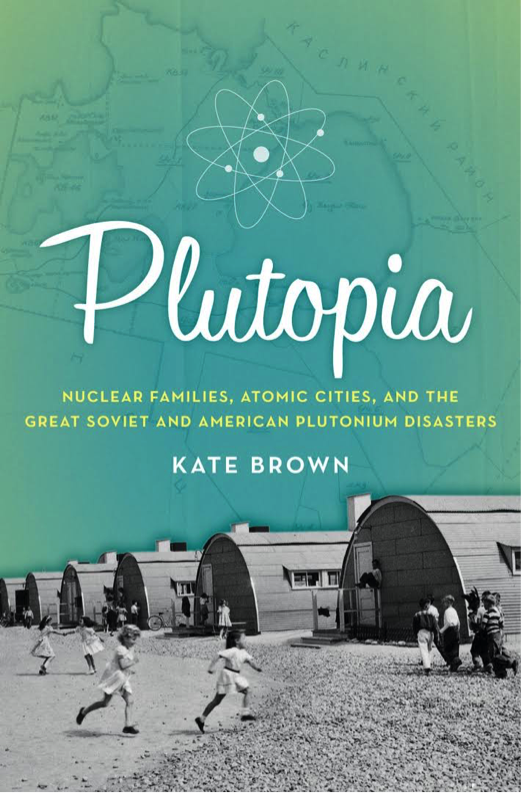 Kate Brown’s Plutopia: Nuclear Families, Atomic Cities and the Great Soviet and American Plutonium Disasters pioneered what she calls a ’tandem history’ approach. Zoning in on Ozersk in Russia and Richland, Washington as two cities constructed to manufacture atomic stockpiles, which reflected each other in sometimes uncanny ways. Both existed, essentially, as a consequence of the other. These newly-formed urban experiments were, in turn, created as model embodiments of their own Cold War civilization: the American liberal, and Soviet communist ways of life in microcosmic form. An intensely focused comparison of both sites uncovers overarching parallels, showing how covert management of increasingly specialised knowledge and practices contributed to ensuing environmental disasters. Since Plutopia’s publication in 2013, this ‘tandem histories’ approach has won a following, for offering a kind of historical laboratory for testing East-West binaries. Articles in Boldyrev and Kirtchik’s special issue also bring new Soviet-American comparisons, with Kufenko, Hagemann and Raskov’s piece on how game theory came to be ascendant on both sides, albeit with different foci. Soviet developments were tailored more around operations research and, perhaps predictably, the organisation of centralised planning. Again, they show how there were real possibilities for dialogue between US and Russian game theorists at international conferences in the 1970s, protected by a thaw in international relations. 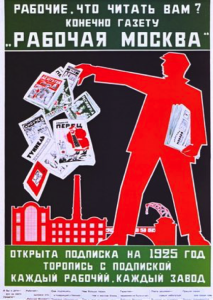 On mass communications science and propaganda research, Benno Nietzel’s article reconstructs both American and Soviet discussions, charting mutual observations and perceptions between the two camps, and framing the field as a branch of ‘psychological warfare’. 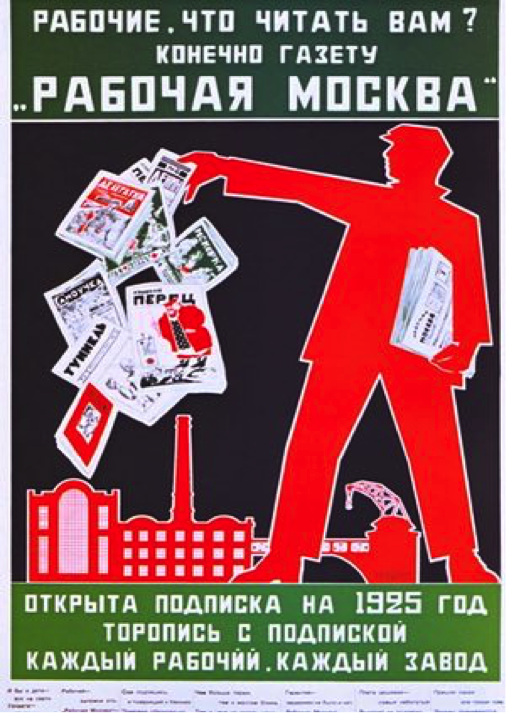 Nietzel reminds us that although the disciplinary field of communications studies in the US predated developments in the USSR by around two decades, the systematic study of propaganda and agitation was a key priority in early Russian Marxist theory, going back to Lenin and Plekhanov, and efforts to chart the reception of Party newspapers among workers and peasants in the 1920s. Case studies that look across both sides of ‘The Wall’ are by no means a new invention to scholars of twentieth-century Germany. The GDR and FRG have long served as a testing ground for tracing the ways in which the same concept, field or profession developed within two antagonistic ideological systems, which nevertheless shared a common heritage until they parted ways after 1945. This is where some of the most productive comparative and transnational research has been carried out on the psy-disciplines during the Cold War. Volker Hess has shown that psychopharmaceuticals – including antipsychotics and tranquillizers – were just as enthusiastically taken up in the East, and even manufactured by the state pharmaceutical companies. Greg Eghigian, on the other hand, shows the subtle differences in the ways that forensic psychology, and especially the category of ‘psychopathy’, offered a scientific way to express political anxieties about abnormality and otherness under the opposing regimes. Jens Gieseke takes up the mantle for the special issue with his article ‘Opinion polling behind and across the Iron Curtain: how West and East German pollsters shaped knowledge regimes on communist societies’. Gieseke explores the FRG’s commercial institute ‘Infratest’, which drew on the similar principles to the Harvard Project on the Soviet Social System, by comparison with the Socialist Unity Party’s own attempts at the ‘self observation’ of GDR society. But What About the ‘Psy’ Disciplines? This special issue is a landmark contribution, but it remains quiet on the question of how psychology, psychiatry and psychoanalysis fared in the East. From the work that has been published in the last few years, we know that there were tangible obstacles to international travel and communication, and substantial ideological restrictions placed upon scientific research at certain points, especially during the Stalinist years. But there were also many cases of surprising intellectual cross-fertilization across both sides, throughout the Cold War. Authors Eugene Raikhel and Dörte Bemme also tell us that there is evidence to say that the ‘psy-ences’ were taken up enthusiastically for building a socialist society – perhaps just as much as they played a part in creating autonomous citizens in liberal societies, and underpinned notions of the democratic ‘open mind’ in the West. What were the socialist counterparts to such models of the political psyche? And did endeavours to construct a New Soviet Man, utilizing psychological sciences, continue through the Cold War period? A new book by Wladimir Velminski suggests that this was indeed the case. But it also shows that these projects sometimes mobilized more esoteric ‘psy’ techniques than one might have imagined, such as telepathy and hypnotism, in addition to more familiar cybernetic or Pavlovian approaches. As such, when we talk of the Cold War ‘psy’ disciplines, we should acknowledge that this also included ‘psychical’ research and genuine interest in parapsychological phenomena. This was, in fact, the case on both sides, as told by Jon Ronson in his popular book, and subsequent film on the American Project Stargate, The Men Who Stare at Goats. Velminsky’s nod to the concept of ‘mind control’ also reminds us of the place that the Soviet sphere held in the western cultural imagination about brainwashing. Fears abounded about Communist indoctrination, false confessions at show trials, and mythologies surrounding Pavlovian conditioning in films such as The Ipcress File and The Manchurian Candidate. This invites us to ask what Soviet ‘mind control’ practices might actually have looked like in practice, beyond the fantasies which played out on screen and in newspapers and magazines on the other side. Were techniques of human conditioning and persuasion developed by ‘psy’ professionals, either for the purposes of winning hearts and minds for the broader socialist project, or indeed in the more insidious interests of the regimes’ intelligence and security services? Or, is there a degree to which our framing of the question in such a way, and focusing on trying to find such instances, might fall into the trap of reiterating the very same prejudices about the East that plagued the Cold War era itself? Over the course of the coming months, the Hidden Persuaders blog will open up some of these questions by showcasing recent work that has emerged on the other side of the Cold War divide. New contributions, for example, will uncover how psychotherapies came to be used for training the perfect Soviet athlete, the ways in which the science of juvenile delinquency became a political cypher in Communist East Germany, and the role state television played in subtly shaping everyday experience in socialist Eastern Europe. Sarah Marks is a postdoctoral researcher on the Hidden Persuaders project. She is co-editor (with Mat Savelli) of Psychiatry in Communist Europe (Palgrave, 2015) and recently guest edited a special issue of History of the Human Sciences on ‘Psychotherapy in Historical Perspective’. Alena Aronova and Simone Turchetti (eds) Science Studies During the Cold War and Beyond. Basingstoke: Palgrave, 2016. 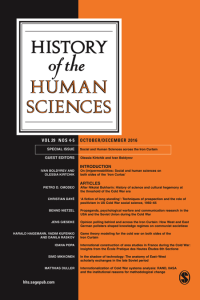 Ivan Boldyrev and Olessia Kirtchik, ‘On (im)permeabilities: Social and Human Sciences of Both Sides of the “Iron Curtain”’, History of the Human Sciences, 29, (2016), pp. 3-12. 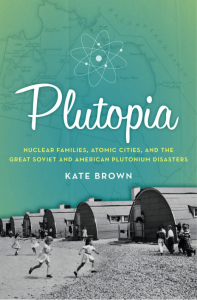 Kate Brown, Plutopia: Nuclear Families, Atomic Cities, and the Great Soviet and American Plutonium Disasters. Oxford: Oxford University Press, 2013. Susan Carruthers, Cold War Captives: Imprisonment, Escape and Brainwashing. Berkeley: University of California Press, 2009. Greg Eghigian, The Corrigible and the Incorrigible: Science, Medicine, and the Convict in Twentieth-Century Germany. Ann Arbor: University of Michigan Press, 2015. Volker Hess, ‘Beyond the Therapeutic Revolution: Psychopharmaceuticals Crossing the Berlin Wall’ in Mat Savelli and Sarah Marks (eds), Psychiatry in Communist Europe. Basingstoke: Palgrave, 2015. Marcia Holmes, ‘The Cybernetic Spectator: The IPCRESS File, 1960’s Cinematic Spectacle, and the Sciences of Mind’, History of the Human Sciences, Forthcoming. Simo Mikkonen, Beyond the Cold War Divide: Entangled Histories of Cold War Europe. Oxford: Berghahn, 2015. Mat Savelli and Sarah Marks (eds), Psychiatry in Communist Europe. Basingstoke: Palgrave, 2015. 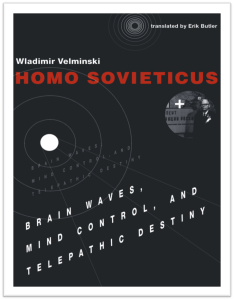 Wladimir Velminski, Homo Sovieticus: Brain Waves, Mind Control and Telepathic Destiny. Cambridge, MA: MIT Press, 2017.